Pupils from year 6 joined with children Sacred Heart to form this year Menphys Choir. 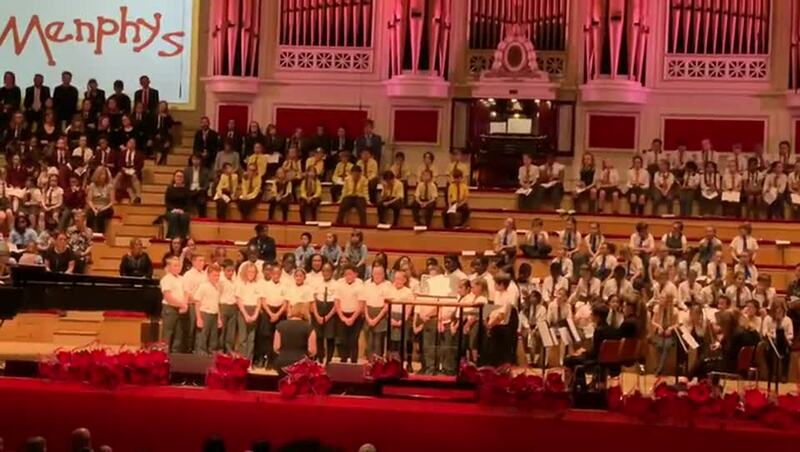 They sang with other Catholic primary and secondary schools from the St Thomas Aquinas Multi-Academy Trust to raise money for the local charity Menphys by taking part in the annual Carol Concert at De Montfort Hall. Take a listen to our joint choirs performance. As we prepare for the coming of Jesus at Christmas. We would like to invite you to take time to think, reflect and pray. The children really enjoyed our Children in Need day where they dressed in spotty clothes or bright colours. They raised £229. All proceeds raised will go to support the work of CAFOD. Follow CAFOD's 2018 online Lent calendar to reflect, pray and take global justice actions throughout the season of Lent. Pupils from year 6 joined with children from St Joseph's Leicester and Sacred Heart to form this year Menphys Choir. They joined with other Catholic primary and secondary schools across Leicester and Leicestershire to raise money for the local charity Menphys by taking part in a spectacular Carol Concert at De Montfort Hall. The children really enjoyed our 'Spotacular' day where they dressed in spotty clothes or 'Pudsey' colours. All proceeds raised will go to support the work of CAFOD. Stay tuned for final amount raised. Many thanks once again for your generous donations of produce. Mr and Mrs Kelly from The St Vincent De Paul Society will distribute your donations via the British Red Cross. Thank you to our 'Faith in Action' group for organising a cake sale to raise money for Red Nose Day. CAFOD's Lent 2017 - Big Fish appeal. As a school we take pride in sharing our Catholic Ethos with others through a variety of fundraising activities. Last Lent, the school Council guided us through collecting coppers and raised £550 for CAFOD. The sale of Poppies raised £299.60 for the Royal British Legion's Poppy Appeal whilst the Christmas play collections raised £400.56 for the Heart Link Children's Charity. This years donations for the Harvest Festival were fantastic, allowing the St Vincent de Paul Society to pass on produce to a variety of people from the sick and elderly to helping refugees through the Red Cross.